1. In a saucepan heat the oil, add garlic and ginger stirring and cook for 5 minutes. 2. Add chilli sauce, soy, vinegar, salt and spring onion whites and turn heat to low. Simmer, stirring occasionally until the mixture is thick and jam like, about 10 minutes. Add the spring onion greens and simmer for 2 minutes. Remove from the heat and set aside and cool. 1. Score the baby squid with a shape knife about 5mm apart, turn the squid around 90 degrees to repeat. 2. Dust the baby squid in rice flour. 3. 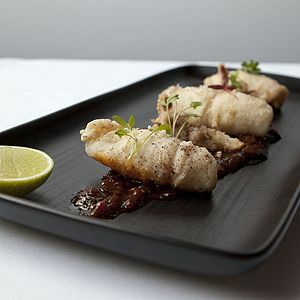 Heat a saucepan up with the grape seed oil and ensure the oil is hot, drop the baby squid into the pan for 20 seconds. Carefully remove and drain on kitchen paper. 4. Season the squid with Szechuan pepper and salt flakes. 5. Divide the chilli sauce onto 10 plates lengthways creating a long base. 6. Place the calamari on top of the sauce, place the picked watercress across the squid and serve ½ lime on each plate.